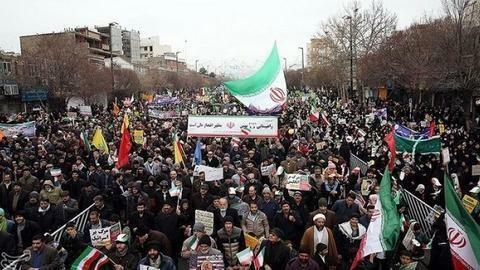 The rallies were held at a time when there is mounting economic and political pressure on Iran, with the US having imposed punishing sanctions on the Islamic Republic. Following a couple of years of intensifying protests, the Iranian army, on February 11, 1979, declared its neutrality in the tussle for power, and paved way for Ayatollah Khomeini to seize power in Iran after the US-backed monarch, Mohammad Shah Pahlavi, fled the country. State television showed demonstrators in thousands marching in different parts of the country holding anti-US and anti-Israel banners. Demonstrators also chanted "Death to America" and "Death to Israel", which were trademark slogans of the 1979 revolution. Further, demonstrators also raised slogans against Saudi Arabia, with whom Iran is locked in proxy wars in Iraq, Yemen, and Syria. Addressing the thousands of Iranians who gathered at Azadi Square in the capital of Tehran, Iran President Hassan Rouhani said that the 1979 revolution had freed Iran from the "tyranny, colonization, and dependence". He added that despite American pressure, the revolution had reached its 40th anniversary, and that Iran would continue to expand its military power and ballistic missile program. While rallies are held every year on February 11 to mark the success of the 1979 revolution, this year's rallies come amid increasing economic and political pressure, courtesy US sanctions. Last year, the US had unilaterally pulled out of the UN-backed multilateral nuclear deal with Iran, and had imposed punishing sanctions as part of its 'maximum pressure' policy on Iran. However, while US President Donald Trump hopes to force Iran into negotiating the development of ballistic missiles, Iran has remained adamant, and has refused to be daunted by the imposition of sanctions. On Monday, too, President Rouhani stressed that Iran would continue on its path to increase its military might - a promise that drew widespread support from the thousands of demonstrators.